Are these France's weirdest festivals? When it comes to unusual events, this annual porcine celebration in south-west France comes top off the list. 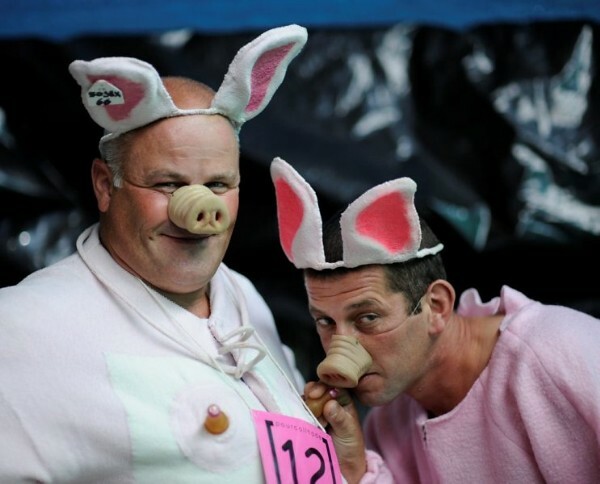 Held in what was once the country’s main pig-rearing region on the second Sunday in August, the festival features everything from stalls selling sausages to piglet races where visitors can bet on which creature they think will win. The strangest part of this event has to be the cri de cochon, or pig-squealing championship, where contestants have to make different pig noises from the various stages of the animals’ life cycle. Sadly, the festival hasn’t been on for the last two years – hopefully they revive it soon! Where else can you go to see a pig-squealing championship?! This tiny village in the north of France is the setting for an annual milk festival attracting farmers from across the Nord department. 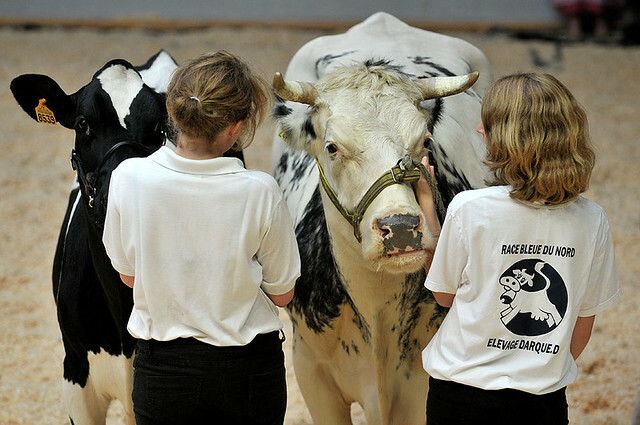 Taking place every year in September, the one-day event will allow visitors to marvel at 100 different specimens of cow and sample some of the area’s finest dairy products. What makes this event particularly unique is the beauty queen competition, where young women from local villages compete to be crowned Miss Protein. Snail lovers will rejoice if they visit the picturesque town of Osenbach in Alsace at the very end of April. The annual snail festival is a serious affair here, so much so that the town even has its very own brotherhood dedicated to the humble mollusc. People come from far and wide for this two-day event with highlights including traditional music and dance, local beer tastings and the all-important snail tastings. The festival also features a traditional snail race, which takes place on a custom-built course. The sweet mirabelle plum is a speciality of Lorraine in eastern France, which is responsible for around 70 per cent of the world’s production. The biggest festival in its honour takes place in Metz, capital of the Moselle département, and is celebrating its 70th anniversary this year. Tens of thousands of visitors attend, with highlights including a giant picnic, concerts, parades, fireworks and the crowning of the mirabelle queen. The centerpiece is a large market, where you can meet growers and sample the tasty fruit. The pastel-coloured Mediterranean town of Menton is bathed in glorious colours every February for the annual Fête du Citron. Floral processions take place along the Promenade du Soleil, accompanied by dancers and brass bands. In the Jardin Biovès, visitors can see displays of soaring citrus-clad sculptures which produce dazzling shades of orange and yellow during the evening light displays. Where else will you see your favourite musical characters made from lemons? For the last thirty years, the Médoc wine-growing region near Bordeaux has played host to its very own marathon. The event, which takes place in September, sees some 10,000 runners negotiate a 42-kilometre course, which has a total of 59 vineyard stops along the way. Participants usually don fancy dress for the occasion and can sample oysters, cheese and foie gras alongside the many different wines. Other highlights include a ten-kilometre winery walk for spectators, dancing and fireworks. Only in France could you find a marathon where the runners stop for wine and oysters instead of sports drinks and protein bars! The Basque town of Espelette pays tribute to its deep-red chilli during a weekend of dances, music and food stalls. The event takes place every October and sees streets throughout the town decked out in red and white bunting as well as strings of sundried red peppers. Particular highlights of the weekend-long festival include a blessing of the pepper harvest on the Sunday and a service given by the Confrérie du Piment d’Espelette. 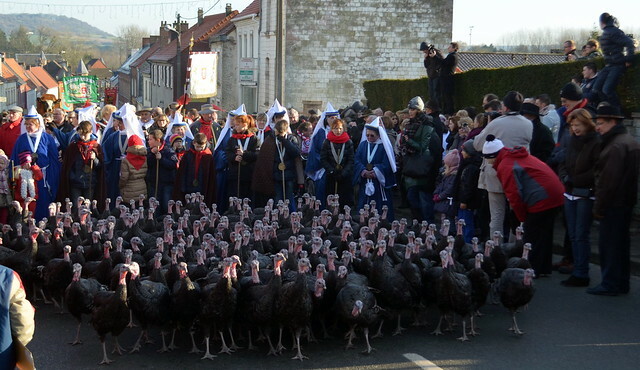 The small town of Licques south of Calais has a big reputation throughout France for its Christmas turkeys. Inhabitants celebrate every December at the local turkey festival, which features parades of the birds through the streets and a competition for the ‘best in show’ title. The festival also features a market, celebratory meal and dancing. Love it or hate it, black pudding, or boudin noir in French, has its very own festival every March in the village of Mortagne au Perche in Normandy. More than 100 exhibitors from across France and beyond come here to sell their versions of the blood sausage and compete to win prizes for the quality of their products. Visitors have the chance to taste all different types of boudin noir, with some of the strangest flavours including chocolate, chilli and cognac. The tasty strawberry is celebrated in grand style for one day each year in the village of Beaulieu. Visitors come from near and far to sample the strawberries, shop at the fruit market and attend culinary workshops where chefs offer tips on making the most of this delicious sweet fruit. The big event has to be witnessing all of the town’s bakers and pâtissiers coming together to produce a huge strawberry tart – which measures 8 metres in diameter and is made using 800 kilos of fruit. This festival entirely dedicated to the earthy truffle takes place every year in the picture-perfect town of Sarlat in mid-January. Highlights of the event include culinary workshops, truffle-hunting demonstrations and a big market where you can meet growers and buy truffles or truffle-based products. Many chefs from restaurants across Sarlat offer cookery demonstrations showing you how to best prepare truffles and other gastronomic specialities from the local area. The charming coastal town of Roscoff celebrates its famous pink onions every summer with a two-day festival. The local onion created a major trade route from the town to much of Britain, culminating in the hundreds of ‘Onion Johnnies’ with their Gallic cigarettes, berets and strings of onions hanging over their bikes. The festival takes place along the quayside and features stalls selling many different onion-flavoured products, from tarts and sausages to chutney and even beer.